The economic growth Wisconsin experienced in 2018 will likely slow down this year, but the state is not headed for a recession in 2019, says Brian Andrew, the chief investment officer with Racine-based Johnson Financial Group. 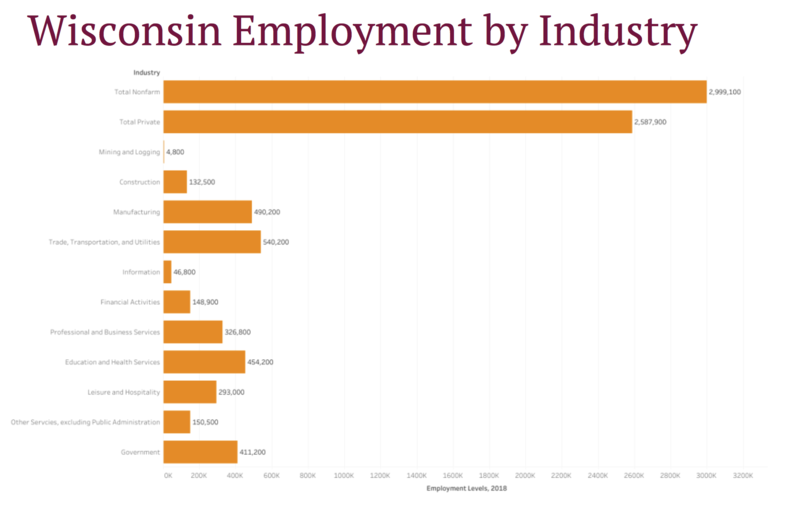 Wisconsin’s two largest economic sectors, manufacturing and construction, thrived in 2018, Andrew said. Education and health care were a close second. About 620,000 of the state's 3 million jobs are in manufacturing and construction. Health care and education jobs account for about 450,000 jobs in the state, Andrew said. The southeastern, northeastern and west-central regions of Wisconsin are the best positioned for growth in 2019, Andrew said, because that is where those industries are the strongest. "If you look at Wisconsin’s economy relative to the national economy, we’re doing better in terms of unemployment and a little better with wage growth" Andrew said. "We have a heavy alliance on manufacturing and construction. I think that should give us a lift in 2019." The national unemployment rate is 3.9 percent. Wisconsin's unemployment rate is 3 percent. Graph courtesy of Brian Andrew, chief investment officer with Racine-based Johnson Financial Group. Still, other segments of Wisconsin’s economy could begin to suffer in 2019. The tariffs President Donald Trump placed on steel and aluminum imports from China in March could continue to cost the state’s manufacturers. Data released by Tariffs Hurt the Heartland in the fall found increased tariffs cost Wisconsin companies an estimated $54 million in summer 2018. Trading partners like China and Mexico have placed their own taxes on United States agricultural products, hurting Wisconsin’s agricultural industry, which will continue in 2019, Andrew said. "In Wisconsin, the place that will be most affected (by tariffs) will be the agricultural sector," Andrew said. Another reason Wisconsin will likely see a slight slowdown in economic growth this year is corporations won’t be getting the corporate tax cut they received in early 2018, Andrew said. In December 2017, congressional Republicans passed a $1.5 trillion tax bill that cut the top corporate tax rate to 21 percent permanently. "That is the most interesting to think about and see," he said. "I think our view today is while the economy and growth rate may be slow, with the pace we are coming out of for the last two years, I really don’t see a recession, certainly not in the state of Wisconsin."